LINGAYEN, Pangasinan, Jan. 09 (PIA) -- A woman referred to as "knockout artist" donated a painting featuring boxing great Manny “Pacman” Pacquiao to the province of Pangasinan where she traces back a part of her roots. Clairyenne “Yen” T. Malanyaon handed a painting of Pacquiao and Miguel Cotto during their fight, to Gov. 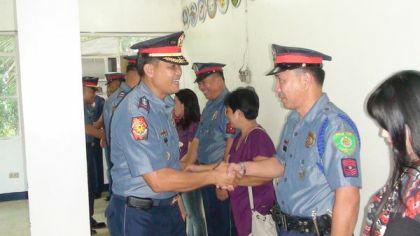 Amado T. Espino, Jr. in her visit to the province on January 6. Malanyaon is the official painter of Pacquiao. “I saw how Pacquiao smashed the giant Cotto so much like David and Goliath,” she said. Espino thanked Malanyaon, for giving honor not just for the province but for the country as well thru her artistic talent. Malanyaon said the subject was a personal choice of the governor. The 36-year old artist said she wants to do a mural depicting Pangasinan--its famous products, tourism spots, development programs of the present administration, the Urduja House, the elegant Capitol, and the overall scenario of the province depicting its past, present and future state. Espino welcomed the idea and said the province will fully support the endeavor. The exhibit is planned to be conducted during the Agew na Pangasinan on April 5. Malanyaon started painting professionally when she joined the Saturday Group of Artists under Malang in 1998 with the Arts Association of the Philippines. In the same year, she crossed paths with the boxing champion thru then Mayor Lito Atienza. From then, she started painting Pacquiao and now has almost a hundred collections of her masterpieces with Pacman as subject. Her works are now handled by Gallery Michael in Beverly Hills and Jack Gallery in Las Vegas, USA.